While Bolivia was featured in the 2017 IPRI Index, there was insufficient data to update the country’s ranking for the 2018 IPRI Index. BOLIVIA’s IPRI score decreased by -0.15 to 3.97 placing it 19th in the Latin America and Caribbean region and 113th in the world. BOLIVIA is classified by the IMF as part of the Latin America and the Caribbean group and by the World Bank as a lower-middle income country. BOLIVIA’s Legal and Political Subindex decreased by -0.4 to 2.97 with scores of 0.96 in Judicial Independence, 2.7 in Rule of Law, 4.58 in Political Stability, and 3.63 for Control of Corruption. BOLIVIA’s Physical Property Rights Subindex increased by 0.24 to 5.38 with scores of 3.41 in Property Rights, 6.94 in Registering Property, and 5.79 for Ease of Access to Loans. 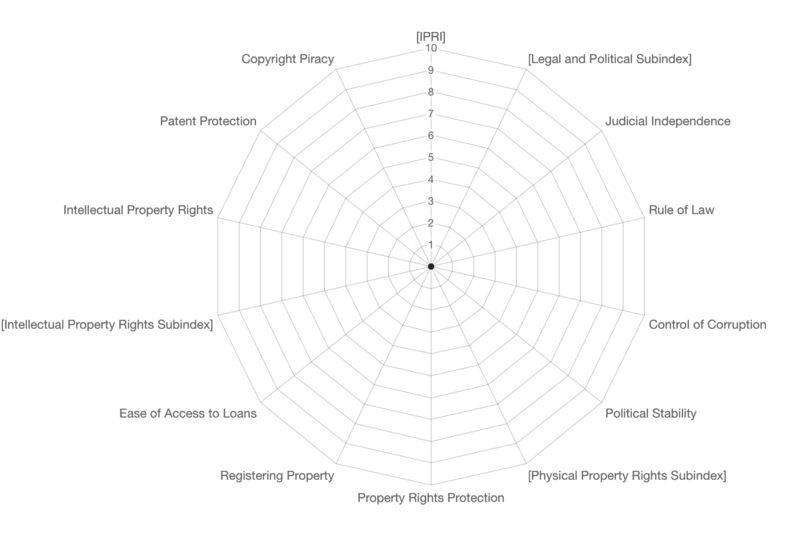 BOLIVIA’s Intellectual Property Rights Subindex decreased by -0.28 to 3.56 with scores of 2.89 in Intellectual Property Protection, 5.7 in Patent Protection, and 2.1 in Copyright Protections.